WALTHAM, MA, MARCH 14, 2018 – Zixi, an industry leader for enabling dependable, live broadcast-quality video over the public Internet, will showcase ZEN (Zixi Enabled Network) Master, a cloud-delivered set of capabilities that reduce the complexity of live/live-linear workflows, at NAB 2018 (Booth SU9110). Making it easy to scale the use of IP video, ZEN Master addresses the industry’s biggest challenges of managing multiple streaming workflows, enabling media organizations to extend their reach, increase their production speed and dramatically reduce operational costs. * Access from anywhere using a Web interface that allows team members to log in from anywhere, create new channels, add content sources or distribution points, allocate resources and monitor a company’s video delivery network at a glance. * Manage live video including point-to-point, one-to-many, multi-cloud, or even multi-CDN. 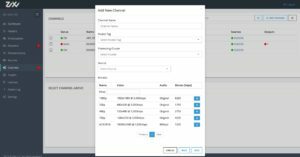 Inputs and outputs for hundreds of broadcast streams are managed without complicated back-end configurations while maintaining automatic configuration details for the resources and distribution targets. * Maintain operational integrity across a network by assigning appropriate access to the new system. Through robust multi-layer user authentication, permissions, and role-management tools, create groups and user profiles to share responsibilities with team members in minutes. * View networks at a glance at any time to verify that sources are connected and providing content. 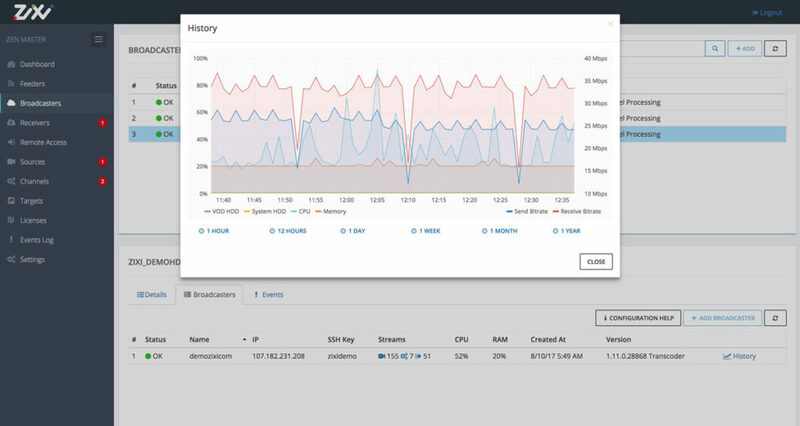 From a single view, drill down to monitor a network at the stream and device level. ZEN Master is the latest set of tools to join the Zixi Platform and Zixi Cloud. The Zixi Platform allows for receiving and distributing HD live streams from anywhere to anywhere using the open internet. Simplifying live streaming, high bit rate streams are transcoded for multiscreen and CDN delivery in a single process, delivering live, broadcast-quality video over unmanaged and managed networks, with reliable and secure protection. The Zixi Cloud lets companies expand video streaming options with cloud-based solutions -offering a far more flexible, scalable and affordable solution for live broadcast-quality content. Zixi provides on-cloud and on-premise solutions and services that enable broadcast-quality HD video delivery over the open Internet. The company offers the Zixi Platform for broadcasters, enterprises, over-the-top video providers and mobile service providers around the world; and ZEN Management, a cloud-based platform that provides tools to configure, orchestrate and monitor live broadcast channels and events across industry protocols. Zixi serves hundreds of customers worldwide via the Zixi Enabled Network of more than 30 OEM and service partners.